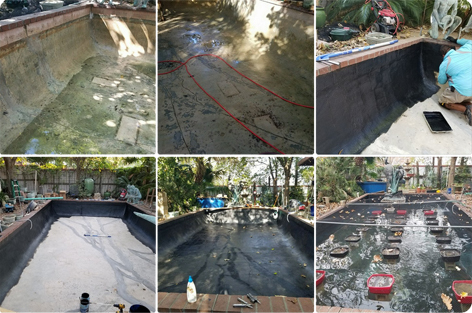 If you are thinking about installing a concrete pond on your property, there are many possibilities when it comes to the shape, and even the size and style. A pond is a fantastic way to add some style to your property, and to give you and your guests a wonderful place to just sit and relax. However, you want to make sure that you are creating your pond correctly, especially when it comes to adding the concrete pond coating to reduce your chance of leaks. Fortunately, getting the pond ready and installing the concrete pond coating tends to be easy to do when you follow some simple steps. The first thing you need to do is find a location for your pond. This can vary depending on where you live and the size of your yard, naturally. You want to find a place that is easy to access and that will provide your property with the aesthetics you desire. Next, you need to decide on the shape of the pond and dig the hole. Depending on the size of the pond, this can be done by hand or with the help of machinery. Since most ponds are relatively small, many DIY enthusiasts simply create the hole by hand. Once you have the correct size and shape, it is time to mix and pour the concrete. Always follow the instructions on the concrete to make sure you are mixing it properly. Once you have the concrete in the hole, you need to let it cure. Even though you might be antsy and ready to finish your pond right now, it needs to cure properly. With concrete it will usually take about four weeks to cure, although it could be slightly longer if there happens to be rain or the air is damp. You can help speed this process up – to about seven days – when you use an accelerator in the concrete. After the concrete is fully set, it is time to clean it. Remove dirt and debris, and use a brush and some soapy water to get it nice and clean. Let it dry fully, and then you can add your concrete pond coating to the surface. It will generally take just one coat, but you need to make sure you have covered the entire surface. Then, you can paint over the concrete pond sealer if you wish. Make sure you are choosing a waterproof paint that is meant for ponds, though. This can add yet another layer of protection to the pond. Next, you can add the water and let it settle. Keep an eye out for signs of leaks. If you have used the concrete pond coating properly, you should not have to worry. Finally, you can add some plants and fish if you would like. The creation of the pond and the application of the coating is relatively simple, as you can see. Just make sure you are always following the instructions provided by the manufacturer of your coating. This entry was posted in concrete pond sealer, Pond Coatings by admin. Bookmark the permalink. © Copyright 2019 Pond Pro 2000. All Rights Reserved.